"Bulldog" as he is affectionately known by us, remains the defining picture of the type of alpaca that we like to see in our pastures. A stud among studs, his capacity, coverage and beauty ooze "Herdsire". A look at his progeny and you realize that his potency rivals his looks. A Champion himself our expectations and hopes ran high for Valentino when he started his breeding career. As he has now been breeding for us since 2003, he has never disappointed. 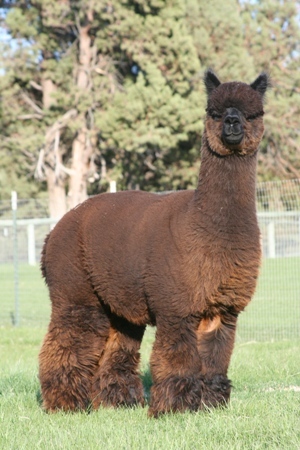 His ultra fine bay black fleece finally rose noticeably above 20 microns in his 5th year to 22.5 micron. That sustained fineness, along with outstanding density and his regal appeal have kept him in a very active position on our "Honeymoon Lane" herdsire row. Considering his production record and his personal attributes, it is honest to say that he could remain here as a breeder for many years to come and that we would benefit from that. 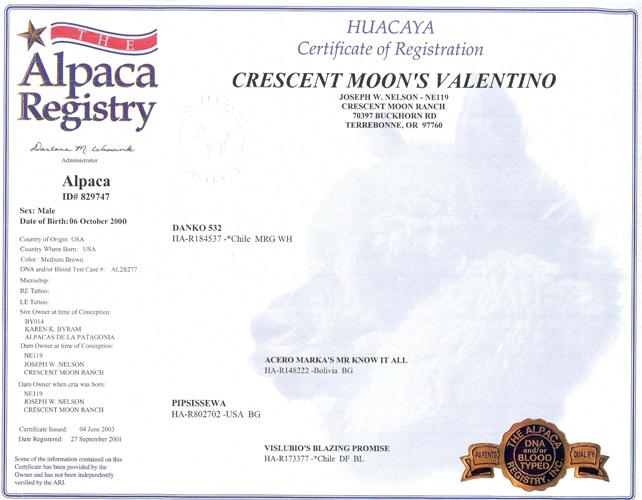 It is our honor and privilege to present for your consideration, "Crescent Moons Valentino". Raise your hand.....Youll be glad that you did! Copyright © 2019 Crescent Moon Ranch. All Rights Reserved.